As a whole (water included) Texas has a square footage of about 7,488, 166,118,400. Divide the current world population into the square footage of Texas results in each person of the world having over 1000 (1089 to be closer to exact) square feet to himself or herself. Makes me wonder if over population is all it's cracked up to be. Same as it was back when folks first came up with it, it's a failure of imagination-- they look around, see the slums of their high-population area, and extrapolate it across the entire world. this is a nice little math problem, but it doesn't come close to realizing the true scope of our population. ...And that link (which I used google cache to check, just in case-- had a couple of nasty sites linked as useful) does the standard "change the subject" trick. 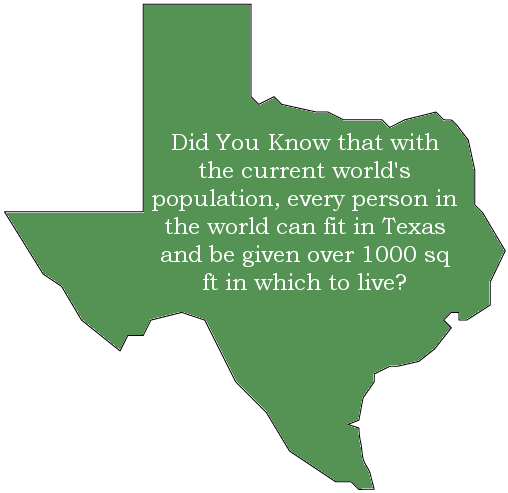 The statement "the world's population, if put in Texas, would have over a thousand square feet per person" is not a suggestion that we should put everyone there, or that they could support themselves on it, or anything else; it is a way to help visualize the "problem." Incidentally, my three-person family (with an open invitation to two more, if they'd ever just accept it) live on a house-footprint of less than 600 square feet. (two story townhouse) It's roomy with just the three of us. The "problem" with this example is that it very clearly lets you realize the scope of our population. Yes, the population of the world is increasing at the alarming rate. If it is not controlled now, it shall be an explosion. Owing to this unnatural growth, the earth is on the verge of annihilation.